Where technology has introduced magical improvements in all areas of life, it has also made distant-crime possible. These days, newspapers are filled with headlines of cyberattacks on recognized firms and organizations. Even small and low scale businesses are not saved from these malevolent attacks and considered to be more vulnerable. Studies have shown that small businesses do not have enough resources to implement higher cybersecurity. Due to short staff, small businesses are unable to control cyber-attacks through advanced IT system. Based on a 2016 survey, a report showed that around 50% small businesses were breached by cybercriminals in the duration of twelve months. Recently a study was conducted in UK, which showed similar results of 52% small businesses being breached by cybercriminals in the respective year. The first reason is that small businesses offer lower risks and higher rewards to the cybercriminals. According to the report of United Nations Office on Drugs and Crime, most of the cybercrimes are reported by small businesses but only 10 percent of those reach a final verdict. The reason is very obvious. Criminals leave an advanced malware in the system of small businesses. This virus resides in the infected system for weeks or even months before an ordinary security software detects it. Some of this malware cleans up itself after data extrusion and leaves no trace behind. Whereas some stays in the system to make sure that no artifacts are left in the computer’s memory to trace the criminal’s system. This advanced malware cannot be detected by small businesses hence leaves criminals with greater gain and lesser risks of getting caught. The report of United Nations clearly state that 65 percent of small businesses have no security policy for their data. Most of the small firms have no cybersecurity policy and UK studies have also proved that only one-third companies have proper legal strategy to deal with cybercriminals. Small businesses are unable to adopt advanced and in-depth cyber policies due to insufficient resources. 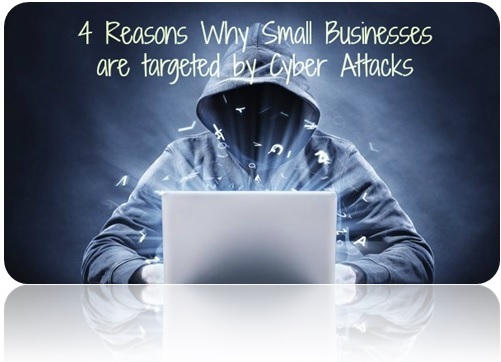 This fact has become a strong incentive for cyber attackers to target small firms instead of bigger enterprises. It’s easier and effortless for them to breach their business systems and trigger data exfiltration. Another reason of cyberattack on small businesses is that their cybersecurity defenses are completely outdated. Due to an ineffective system, they are unable to deal with advanced level of threats. Cybersecurity defenses such as firewalls, intrusion prevention system, gateways and antivirus software are essential but not effective enough to keep the system secured from advanced malwares. These outdated defenses prevent the virus but advanced attacks are made up of new exploits which cannot be detected or stopped by these traditional technologies. The last but not the least reason is that small businesses hold a valuable information that interests cyber criminals greatly. They have the credit card number and personal information of customers. Small firms also keep an access to financial data of employees as a demand of business. Hackers use this information to breach the bank accounts of people and make illegal monetary transfers. As small businesses do not adopt advanced cybersecurity policy, hackers find it easy to gain the beneficial information from their system. All in all, the issue of cybercrime is for real and all firms, large or small, should take serious actions against this practice to secure their confidential data. This article has been written by Bestin George. He is a cybersecurity expert and also writes blogs for Write My Essay For Me. He received his post-graduate degree from a UK university in 2014.